The Virginia Museum of the Civil War will present a Civil War Christmas program at the New Market Battlefield State Historical Park on Saturday, Dec. 3, from 10 a.m. to 4 p.m. This event, which is free with paid park admission, will allow visitors to explore what Christmas in the Shenandoah Valley was like in 1859 as a slave insurrection at Harper’s Ferry was suppressed and young men were called to active duty at Charlestown. 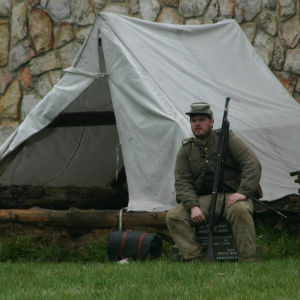 Likewise, visitors will have a chance to experience the camp of the 51st Virginia Infantry outside New Market in December 1864, with low rations and even lower morale. Inside the museum, visitors can create ornaments for the museum’s tree or their own tree. A special showing of Old Time Christmas from the Shenandoah Valley will begin in the museum theater at 2 p.m., and the museum gift shop, the General’s Store, will be open for Christmas shopping. Admission is $10 for adults age 13-64, $9 for adults age 65 and older, and $6 for children age 6 to 12. Children 5 and under are admitted free of charge, as are VMI cadets, parents, and VMI alumni.